Over the past decade, democratization and civil society promotion became key variables in preserving global security and the liberal economic market. This book examines the prevalence of democratization policies as a hegemonic geopolitical tool; these policies represent a concerted political effort in which civil society organizations are manipulated through funding strategies. 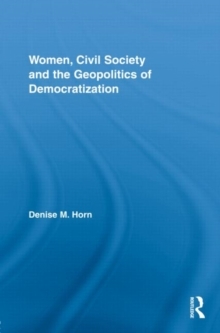 Denise Horn offers a fresh, innovative feminist-constructivist perspective by arguing that Western gender norms-i.e. those norms that determine degrees of participation within civil society-inform the policies of hegemonic powers and transform the foundations of civil society in transitional states. This powerful volume will be of interest to students and scholars in Gender and Women's Studies, Political Science, and International Relations.